DanceDanceRevolution is a game where you use your feet. It makes you move. A lot. And whether or not it was Konami’s intention to market DDR as a fitness tool, many people in the Western world had discovered the game’s benefits for fitness and weight loss. This angle caught much of the media’s attention around the peak of its popularity in the early 2000’s. DDR had been featured in many news segments including The Today Show, FOX News, Tech TV, and other local news stations. Combining the enjoyment of video games with a side of exercise and weight loss was a sure way to get more people into playing. 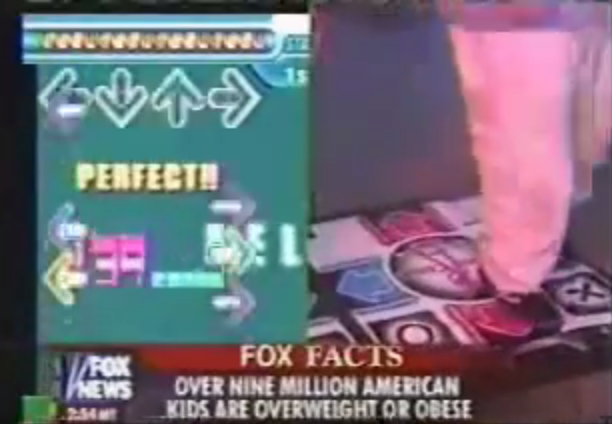 FOX News segment on DDR and childhood obesity. Recently, a community member who goes by xopher314 made a post on Reddit detailing his weight loss journey through playing DDR resulting in losing about 55 pounds! That is a significant amount of weight! Of course, xopher314 isn’t the only one who has found success. Sm00t lost as much as 70 pounds from playing DDR and he is still keeping up with playing on his Twitch channel MysticThickness. There are many others who have found success and have chronicled their experiences, and if you are interested in a fun and exciting way to lose weight or stay fit, you can do it too. xopher314 at 300 lbs. playing Holic Heavy Doubles. In an effort to combat childhood obesity, West Virginia public schools began adding DDR to their gym curriculum. Konami has even created a special edition of the game called DDR: Classroom Edition to provide schools with the game and pads to get their fitness programs started.